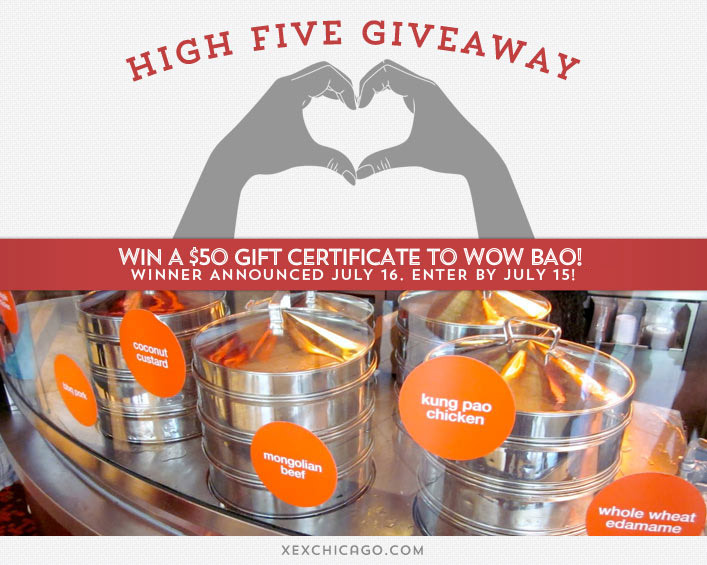 Win a $50 Gift Certificate to Wow Bao! Congratulations to Sarah Johnson on winning our ninety sixth High Five Giveaway! Thanks to all who entered. For our next High Five Giveaway we have a $50 gift certificate to Wow Bao. Wow Bao specializes in savory steamed buns – a favorite portable snack throughout Asia, pan-seared potstickers, steamed dumplings, fresh soups and salads, rice bowls, and homemade fresh ginger gingerale. A major “fast food” throughout Asia, our bao flavors include: BBQ Pork, Thai Curry Chicken, Spicy Mongolian Beef, Kung Pao Chicken, Teriyaki Chicken and Whole Wheat Edamame. To help start the day off healthy and delicious, Wow Bao offers three flavors of breakfast bao: Bacon, Egg and Cheese, Spicy Sichuan Sausage, and Egg, Spinach and Mushroom. And for the dessert lover in us all, Wow Bao features two, Coconut Custard and Chocolate. Wow Bao has multiple location in Chicago. The closest one is just steps from XEX at 1 West Wacker Blvd, Chicago, IL. Visit their website at www.wowbao.com or call them at 312.658.0305 for more information. One of XEX’s longtime clients has recently written a book. What is the name of the book? Hint: Check our our latest blog post for the answer! Now, just add a comment to this post with the right answer to be eligible to win! The winner will be announced on Wednesday, July 16. Enter by midnight on Tuesday, July 15. C, You Can Do It! 🙂 I love that place! C! You can do it! It sounds like a good book! C- You Can do it!